“Battle of the Cookie! Pug vs. Baby” is one video where a dog displays several warning signs of a potential bite (thankfully, no one was hurt). Being a professional in the world of animals, my social media feeds are generally chock-full of doggy photos, kitty memes, and adorable pet videos. But recently, there has been a disturbing trend among these videos and the longer it goes on, the more dangerous the situation becomes. I’m talking about the videos where a baby, toddler, or child is interacting with a dog in an unsafe manner and, in spite of the clear inappropriateness of the situation, and the dogs many clear demonstrations of stress, an off-camera adult is holding the camera and chuckling. Perhaps equally disturbing are the comments below each video, such as “No way a yellow Labbie would hurt anyone” or “People, not all dogs have food aggression,” and “Baby is in no harm.” Really? No harm? Dogs give warning signs nearly every single time before biting someone. No matter what breed, or how well trained or socialized, it is incredibly rare for a dog to bite someone actually out of the blue. But, if you are not watching for the signs, you are not listening to what your dog is so desperately trying to tell you, before he resorts to his last option — a bite. In “Battle of the Cookie! 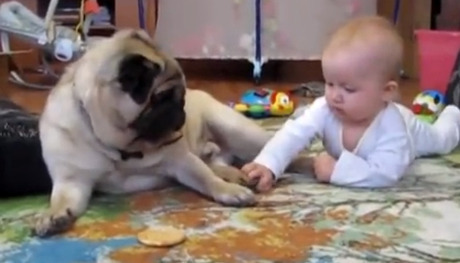 Pug vs. Baby,” we have nearly two minutes of giggling, oblivious parents, one baby in danger and a Pug who has no way of understanding why this small, hairless creature is not heeding his warnings. The pug starts off with a stress yawn, following that with a wide “whale eye,” pawing, a lip curl, hackles up, lunges, and a growl. By my count, this dog gives fifteen warnings in less than two minutes. The baby, understandably, heeds none of them. The parents, disturbingly, find each warning entertaining. Another that gives me the creepy crawlies is “Rexy Baby Rides the Dog” where we have a baby, obviously, riding a Boxer, which is a problem in itself. The baby pulls the dogs ears, and lips, while dad is behind the camera laughing. The dog, Chili, licks her lips (dog language for, “please stop, I am uncomfortable”), turns away and averts her gaze repeatedly. A wagging tail is not always a sign for happiness, and while there is no doubt that both of these dogs are remarkably patient with the children in the videos, there is also no doubt that this same scenario is played out in the majority of more than 2 million cases of children being bitten by dogs in the U.S. every year. After a dog seriously bites a child, it is often either euthanized, or brought to a shelter where it will be labeled “aggressive with children,” even if the dog was begging, and pleading for your intervention before the bite occurred. Regardless of breed, a dog with a bite history can be a tremendous challenge to place in a home, and is often still put down. Please do not assume the breed of dog guarantees a certain set of behaviors in these situations. Dogs of all breeds have a limit and it just isn’t fair to expect them to ignore the boundaries that they are trying to set for little ones in our homes. When a dog bites a child in their home we often hear, “no one ever saw it coming.” Unfortunately, in many of these cases, a professional could see it a mile away if they were given the chance. We leash our pets in traffic. We vaccinate them against disease. Can’t we keep our most vulnerable family members — pets and babies — safe by learning the signs to protect them both? Check with a local professional trainer and learn how to read the signs. Because until we learn to speak ‘dog,’ we have to learn a common language of love.